A year ago, the people of Crimea were heading to the polls to make probably one of their most crucial decisions on the status of the peninsula in the Black Sea. A large majority voted in favor of rejoining Russia. Since the beginning of the Maidan uprising in Kiev in November 2013, Crimeans started fearing the rise of neo-Nazism and nationalism. Crimea, which is home to an ethnic majority Russian population, refused to recognize the new government which came to power in February 21 as legitimate. The citizens of the peninsula feared that the new leadership would not represent their interests and respect their rights. Crimeans were particularly unhappy over the decision of the post-coup Ukrainian Parliament to revoke the law allowing using minority languages – including Russian – as official along with the Ukrainian tongue. 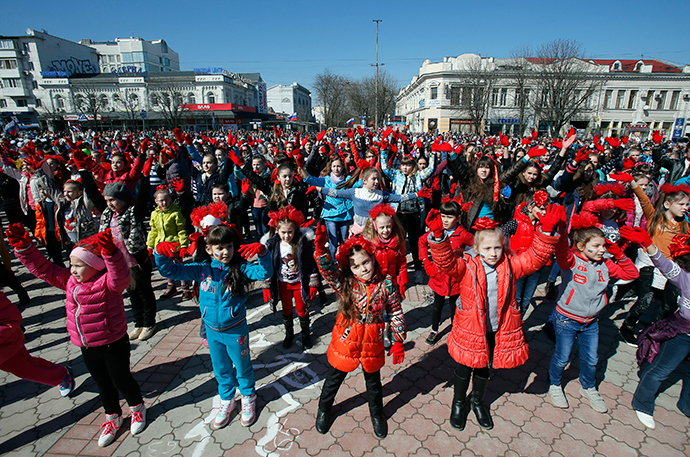 Crimeans staged mass anti-Maidan protests and asked Russia to protect them. According to the 2001 census, over 58 percent of the Crimean population is ethnic Russian, about 24 percent Ukrainian and about 12 percent Crimean Tatar. People in Crimea and Sevastopol, which is a city with a special status on the peninsula, eventually decided to vote for independence from Ukraine and to rejoin Russia at a March 16 referendum. The crucial decision was made by 1.2 million people, 97 percent of eligible voters. A year later Vladimir Putin explained why Moscow decided to accept Crimea’s bid to join Russia. Russia “cannot let the [Crimean] people be pushed under the steamroller of the nationalists,” Vladimir Putin stated. 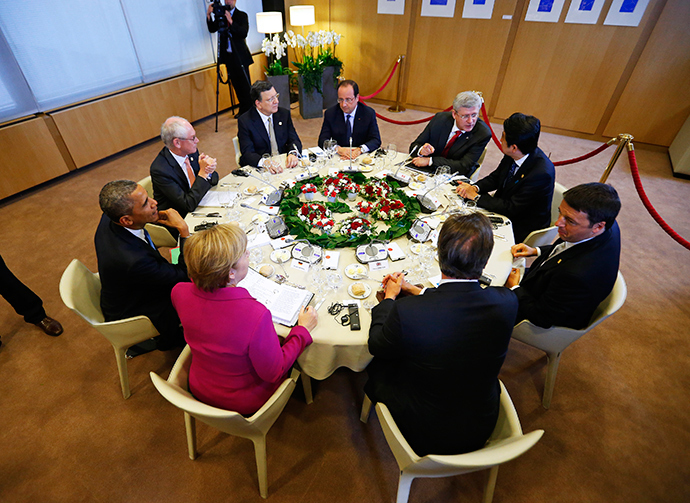 “Our goal was not to take Crimea by annexing it. Our final goal was to allow the people express their wishes on how they want to live,” he said. Russia finalized the legal process of taking Crimea under its sovereignty on March 21, as President Putin signed a law amending the Russian constitution to reflect the transition. “I ask lawmakers of both chambers to work actively and do everything we can, to make the transition process not only painless, but also beneficial for all Russia and the people of Crimea,” Russian President Vladimir Putin said on March 21, 2014. The results of the Crimea referendum were not recognized by the majority of Western nations, which claimed that the referendum was held “under Russian guns” and implied that Crimea was taken by Russia through a military occupation. US President Barack Obama called the referendum “illegal” while British Prime Minister David Cameron stated that the decision to “annex” Crimea would result in Russia facing “serious consequences” for the alleged breach of international law. Amid an almost global campaign by Western governments to call the referendum in Crimea illegal, there appeared some politicians who have a milder attitude towards the pivotal poll. Among them was a former president of France, Nicolas Sarkozy, who said in February this year that Crimea cannot be blamed for seceding from Ukraine – a country in turmoil – and choosing to join Russia. The leader of the French National Front party, Marine Le Pen, went even further, calling upon the French government to officially recognize Crimea as a part of Russia. The peninsula became part of Russia in the time of lawlessness following an orchestrated “coup” last year, when “Neo-Nazi militants organized a revolution in Ukraine,” the French politician said. The world seems slowly to accept that Crimea is now a part of Russia. 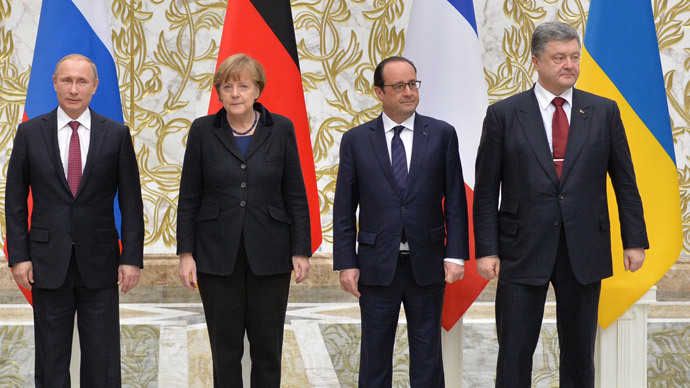 The recent talks in Minsk on February 12 on hostilities in Ukraine’s east didn’t include the Crimean referendum. “The 13-point agreement, which now forms the basis of future EU decisions on Russia sanctions, doesn’t mention Crimea,”says the paper. The map of Russia which included Crimea was adapted in US some media. 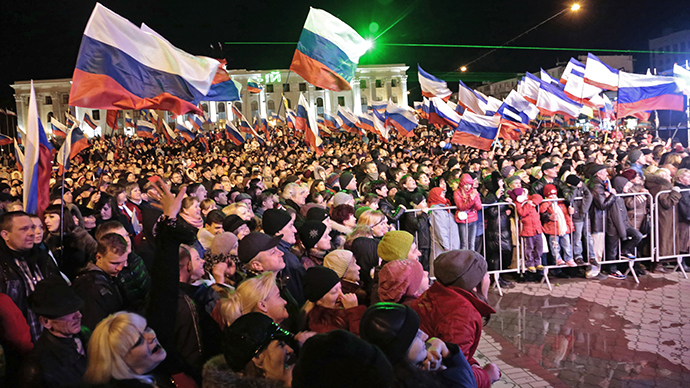 The majority of Crimeans believe that reuniting with Russia is a positive development, says a recent poll conducted by Russian Public Opinion Research Center from February 2015. If the referendum was repeated today, at least 90 percent of residents would have voted in favor of rejoining Russia, while only 5 percent said they wanted to be a part of Ukraine. Also 86 percent of people in Crimea are satisfied with their life in the republic.